A pet groomer’s goal is to enhance the appearance of companion and working pets. Although most pet groomers work primarily with dogs, there are a small number of cats that also need grooming. Dog Grooming 101 will teach you the basics of what you'll need to know to become a professional pet groomer. Some pet groomers have their own business while others are employed by veterinary clinics and hospitals, pet stores, boarding kennels, and animal shelters. Pet groomers are responsible for bathing animals and keeping them tidy by cleaning ears, trimming nails, shaping and blow-drying fur, and dematting and brushing coats. The tools required for the job include grooming shears, electric clippers, and combs. Don't forget that they must be sanitized to prevent the spread of disease. You'll also need shampoos, conditioners, and other grooming supplies to clean the animals' eyes and ears. Remember that professional grooming isn't all about the coat, it's about the overall appearance of the animal. Other professional pet grooming duties include watching for signs of illness in pets and referring pet owners to the right veterinarian if necessary. Neither a license nor a formal college education is required to be a pet groomer, however there are certain legal requirements depending on what region you live in. The table below has more information about this career. If you're thinking that being a dog groomer will be an easy profession, think again! If you're thinking that it would be great to own your own business because you wouldn't have to answer to anyone and it would be much easier than working for someone else, think again! There is nothing easy about owning your business, no matter what it is. You need to be prepared to work long hours, nights, and weekends, especially in the beginning. You need to be prepared to wear many different hats. You'll be the janitor, office assistant, dog groomer, and handyman in the beginning. Don't forget about advertising, social media management, and customer relations. If you think becoming a dog groomer is right for you, our Dog Grooming 101 articles will help you figure out the first steps you'll need to take. Although you aren't required to have any specific education, courses are available to help you start in the pet grooming industry. A general pet grooming business typically entails washing and grooming pets. Pets to be judged in the show ring require specialized grooming styles, and you will probably need additional training for that. Although not required, it can’t hurt for dogs competing in obedience trials to look well groomed. While the Americans with Disabilities Act says that a person with a disability has the right to be accompanied by their service dog almost anywhere the general public is allowed, a neat, clean dog is much more welcome, and that's where a groomer can help. Although some dogs need to be groomed much more often, every dog needs some type of grooming once in a while. Whether it is to have their ears and eyes cleaned or their toenails clipped, you can market your business to cater to all pet grooming needs. With the right research you could make a dog grooming successful no matter where you're located. Our Dog Grooming 101 columns are great, but you'll more education than that. Many schools around the country offer pet grooming classes. The cost and length of the classes vary depending on the curriculum offered. If there are no training courses in your area, many schools offer online grooming programs as well. The following topics may be covered when taking a pet grooming course: fluff drying and grooming matted fur, ear cleaning, nail clipping, coat type, breed recognition, biology, anatomy, first aid, and safety. In addition to basic grooming classes, some schools offer specialty courses such as learning to create patterns by cutting the main coat and fur near the tail, ears, and head to highlight features of specific breeds like poodles. An alternative is to enroll in an animal care or pet grooming program at a technical or community college. You'll study clinical pet grooming techniques as well as topics in small animal welfare and feline and canine nutrition. Your study will often result in a diploma or certificate upon completion. Some programs can take a few months to complete while others may take about a year. If you're interested in earning voluntary certification, credentials as a National Certified Master Groomer are available through the National Dog Groomers Association of America. You must take a practical examination to demonstrate your pet grooming skills and a written exam if you want to get certification. You'll be tested in areas such as breed identification, anatomy, and general health. An overall average of 85% or higher is required to pass. Experience in the field of pet grooming is crucial, especially if you choose to forego taking classes. A great way to gain experience is to get a job as a pet grooming assistant. You may also be able to talk to an experienced groomer and get them to agree to let you do an apprenticeship in their shop. You can think of apprenticeships as the hands-on version of Dog Grooming 101. Apprenticeships may last approximately two months and require you to serve under the supervision of an experienced pet groomer. Or you can gain experience by shadowing another groomer who is willing to educate you for free. Grooming pets owned by your friends and family is another great way to boost your resume and get free, hands-on experience. It is imperative that you keep up-to-date on the latest grooming tools and techniques. Look online for informational literature to help with self-studying. Tutorials, study guides, and other learning tools are also available online. The National Dog Groomers Association of America, Inc. (NDGAA) hosts grooming workshops in many locations. By participating in one of their workshops, you can fine-tune your skills in working with thinning shears, carding blades, and stripping knives as well as improving the symmetry and balance of your grooming work. They also sell a breed-profile study kit. The NDGAA offers two phases of certification: National Certified Groomer and National Certified Master Groomer. You must complete an NDGAA training workshop in order to take the practical grooming test and sit for written exams for the National Certified Groomer designation. 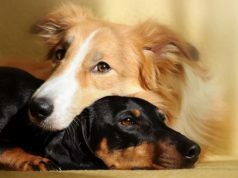 When you have completed those requirements, you will be asked to demonstrate your skills on four dog breeds: long-legged terriers, short-legged terriers, sporting dogs, and non-sporting dogs. Only after passing the breed exams can you take an additional written exam to become a National Certified Master Groomer. With certification, you can become a member of the NDGAA, which allows you access to grooming seminars and networking opportunities along with other benefits. If you feel a career in pet grooming is for you, start with researching what it takes to become a pet groomer and the specifics of the occupation, including salary, employment outlook, and education requirements.